Why invest in the Indian Equity market? How to invest in the stock market correctly? How to trade using the d-mat account? Why the stock prices move? How to pick the correct stock? India is a developing country and is a paradise for foreign investors and institutions countries like China, United States of America and United Kingdom.Those are all developed countries but there is a drawback the companies that operate in these countries are matured to its full potential. What that basically means is that they have grown so much over the years that there is only a tiny room for further growth.Whereas in India you cheap labour and high exports goods. GDP and unlimited resources with high consumption it becomes or rather is the world's best investment hub. During the 2008 recession the world was suffering as its financial markets collapsed. But India on the other hand was as steady as a rock investors all over the world have so much faith in the Indian government.Especially the Modi government that more than three billion dollars of funds inflow and keen in the Indian economy in the last 24 months alone Indians to use jobs from the foreign countries, leaving the foreigners jobless, but what we don't know is that the foreign countries invest in a stock market making three times more than money there by robbing us of our own wealth. Friend, let me give you a simple example an investment of one lakh in 2009 would give you 250 shares of either motors each share costing 400 rupees approximately today in 2019 your investments worth would be 57 point 2 lakhs each share costing 23 thousand each approximately. So you can see the potential of the Indian economy and the growth of the Indian economy. I show Motors is basically a truck manufacturing company but it also owns the royal enfield brand.There are many other examples but this is one of the most prominent example which about India's favour form of investment the bank fixed deposit and let me tell you how bad it is as an investment for an individual. In India you made an investment of 10 lakhs and the bank will give you an interest rate of 7.5% per annum so 12 months later ,your investments value would be 10 lakh 75 thousand. See what you don't know is that your profit is not exactly 75 thousand there are certain taxes which are applicable on the profit the first one is TDS of 10% which comes out to be 7500 the second one would be the income tax lab . let's assume you fall in the second income tax slab which is of 20% so a deduction of 13,500 again so overall if you see your total gain is only 54,000 on an investment of 10 lakh for 12 months right now. let us see something about inflation since you made a profit of only 7500 just a second your total gain is only 5 point 4 percent per annum the indian inflation rate as of 2008 July is 6.3 1% so overall you're making a total capital loss. or 1%. what a capital loss is let's say you buy 10 kg a bag of potato today 400 rupees so 12 months later due to inflation your amount would end up being 106 point 3 rupees now let's say on the same date when you bought the bag of potato you made a fixed deposit of hundred rupees assuming that next year you might have a higher purchasing power but what happened is due to the interest rate of 7.5% and all the tax deductions you only end up with 105 point 4 rupees so overall next year you need to pay 1 rupees additionally to buy the same bag of potato . You bought like today because of the inflation rate so basically this is called the car the corrosion of capital which is extremely bad form of investment and since most of the investors in India like or other people in India are not aware of this factor they're losing their money they are not gaining the capital rather losing the capital and corroding the capital. Indian nifty has a benchmark return of ten point eight percent for 12 months now let me give you situation let's say an investment of 10 lakhs today in the market if you withdraw the fund maybe within 12 months you are entitled to pay only fifteen percent tax on the profit whereas if the investment in this stock is above 12 months it is absolutely tax-free the example here is let's say you bought 100 shares at 300 rupees each and sold the shares at 332 each next year after 12 months so if you solve these shares after 12 months you are entitled to the total profit without any certain deductions.but let's see you solve the stocks before the 12 months you need to pay a tax of 15% of the profit which is two five five zero which is not bad you're not losing your capital you're making a higher return on your capital right . How the structure of investment cycle works? The first one is an investor which basically means me and you .we need to deposit our funds in the back now from the bank. We need to transfer our funds to the d-mat account or the stock broker now I would suggest you to have account like talk with your bank because they usually have a d-mat account present with their banking system so you can open a d-mat account with them just call the mob they will tell you how to open the teammate account so once you open a d-mat account basically you need to transfer your funds from the band to the d-mat account or the stock brokers account now once the amount is transferred to the d-mat account you can purchase the stocks or the company shares from the d-mat account your preferred shares which you want to purchase the d-mat account now there are certain d-mat accounts like I told you earlier the first one would be access securities which is linked with access bank then there is yes invest which is linked with yes bank third one again ICICI Direct is . they will give you a demo on how to purchase the stock how to transact the stocks and all and this will again help you to navigate through the sections so that you can buy or sell the desired stocks so the structure of the GMAT account. Now let's think about company shares and stocks there are two type of exchanges in which we can create in the Indian stock market the first one is the national stock exchange, which I would like to talk to you about and the second one is the Bombay Stock Exchange. Now I would recommend you to trade in the national stock exchange for the starting point because it's a bit like sefa because you see there are 5000 plus listings in the national stock exchange because they have a higher criteria which the companies need to fulfill in in order for them to be listed in the National Stock Exchange , whereas the Bombay Stock Exchange has more than 7,000 listings. It is because they have a smaller parameter which companies need to succeed or satisfy in order for them to be listed in the stock market on the secondary market so try trading in the National Stock Exchange or the NSE for the beginners okay let me talk to you about the stock market prices and how they move consider the basic case of demand and supply ,if there's more demand ie more buyers the stock prices will go up and if there's more supply ie more sellers the stock prices will go down the price of the stock VC on the TV screen flashing and on the mobile app is basically the market value of the stock the market value of the stock, basically means the value of the stock considering its assets like its operating cash balance building. It owns at its present value plant its own and production capacity etc and on the other hand liabilities like loans which the company needs to pay back the interest it needs to pay off etc . if you notice I'm writing about the friggin ative speeches here figure 2 figures here actually we do not consider the value of building it purchased at or the cost of acquiring the plan 20 years ago . 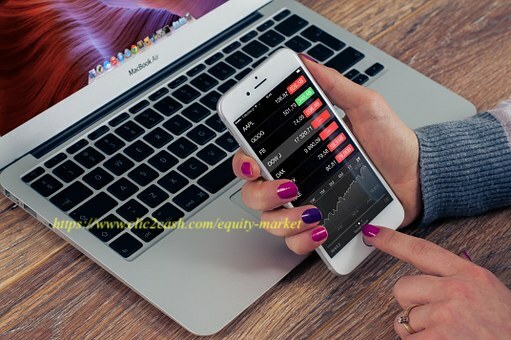 We talk about the intrinsic value of the company big financial institutions calculate the fair value of these assets and liabilities to determine the market price or the intrinsic value of the company hence the price at which the assets where acquired are irrelevant to the market price calculations . The prices go up and down based on the assumptions but the company's performance and the profit and loss.It can make over the time you as an investor need to keep in mind whether the company is able to make profits in the long run and won't collapse in case of a short-term problem. Let me give you an example let's say Maruti Suzuki plans to launch a new car this month that Masek Allah means more sales for the company which would boost up the revenue and profits hence the prices will go up because investors think it will do well to launch the car and they will start buying the shares of the company. The second example would be Larsen & Toubro the infrastructure giant lost a big deal to build a bridge let's assume that this will cause the company stock prices to go down because investors will feel it lost the project hence the revenue the less revenue for the company and then investors would start to sell their stock holdings . how to find the ideal stock to invest use your gut scale unless in the company you have always heard about from people in general from news or some company you whose product you use and have full faith in the company. Survival Google sorts the stock and read the new section invest if you feel the company is on the right track follow the news channel the business news channel will keep showing you good stock picks and every now and then you can choose the best one you like out of the list a try installing the money control app on your mobile phone . it's available on Android and iOS as well so you can just go to money control com click on the link it will show you the app installation pages from where you can navigate to the installation of the application now money control comm is a stock news and activities website keep a track of the activities in the website and install the mobile app like I told you earlier which will help you to keep a track of the movement of the stock which you are interested in use technical analysis technical and I'll analysis is a widely used talk movement study stock traders you use this technique to determine. The stock movement ie the change of the price whether it go up or will go down is calculated using the study of charts with indicators like momentum the force of the investors whether they are buying the shares or selling the shares and so on so forth the fifth one is the fundamental is both long-term investors and short-term traders use this technique to determine the price movement using company's financials like the Book value the price to earnings ratio etc like what B's what this basically does is it calculates whether the company is going to make profits in the long run assuming their cash flows the structures of their asset holdings and so on.